Where I grew up in suburban Portland, Oregon, there were (and I imagine still are) a lot of pizza restaurants that welcomed families. Our favorite was Pietro's, which had a mini video game arcade in the back that I used to entertain myself while our pizza baked--a typical entertainment at the time that I'm sure those of you from my generation will remember fondly. It's an experience that kids today don't have. They just whip out their phones to play games, and thus they are deprived of that ever so valuable childhood experience of escaping your parents for a few minutes. Comet Ping Pong has brought that experience back but not with video games: the back of the restaurant is full of ping pong tables. It's the first among many reasons why Comet isn't your typical neighborhood pizza joint. Comet opened in 2006 as an offshoot of Buck's Fishing and Camping, the casual-upscale neighborhood restaurant two doors down that serves really great food and an especially good burger. The first thing I noticed about Comet was its retro neon sign, which the restaurant acquired from a liquor store in Adams-Morgan that my roommate and I frequented when I lived in that neighborhood in the early 2000s (Comet Liquor had been run by a delightful older couple who passed away in the mid 2000s). Initially, I wasn't sold on Comet. The restaurant set up was very casual, perhaps too casual. During our first visit, the menu was written on a chalkboard and consisted of red or white individual pies with your choice of toppings. When I asked the server how much the pizza cost that I wanted to order his reply that it was "$10 or $11," an annoyingly nonspecific answer. When the surprisingly small pie arrived it was missing one of the two toppings I'd asked for, but it had taken so long to get to the table that I didn't dare ask for a replacement. Needless to say, we didn't go back for awhile, but I'm happy to say that Comet quickly upped its service, developed a proper menu and has been one of our favorite pizza spots for many years. Comet's pizza is quite a bit more sophisticated than the neighborhood pizza of my youth. Rather than a large for the table to share, Comet sizes their pizzas individually, and they're just the perfect size. We rarely take any home but also don't feel overstuffed. Comet's menu offers about a dozen pizza choices (in addition to make-your-own). We have several favorites. I love The Smoky, which reminds me of the smoky grilled food at Bucks. 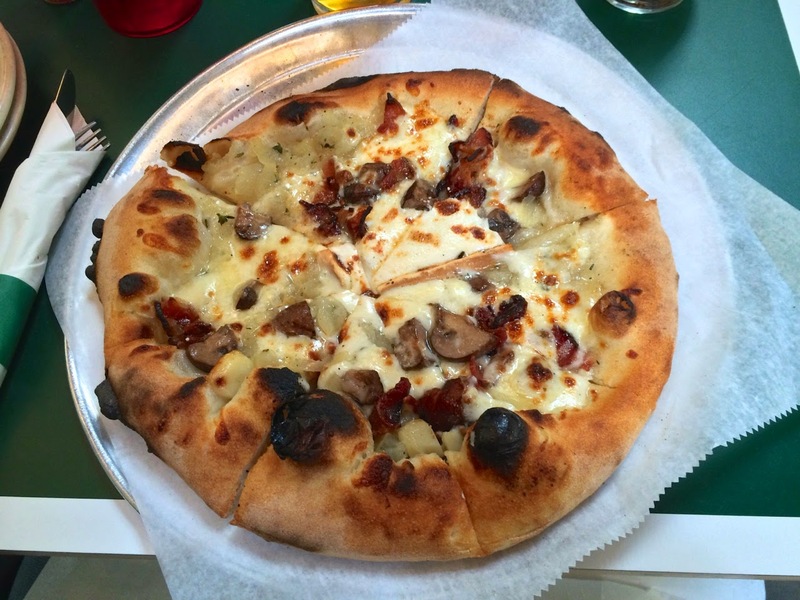 It's topped with bacon, smoked mozzarella and smoked mushrooms. 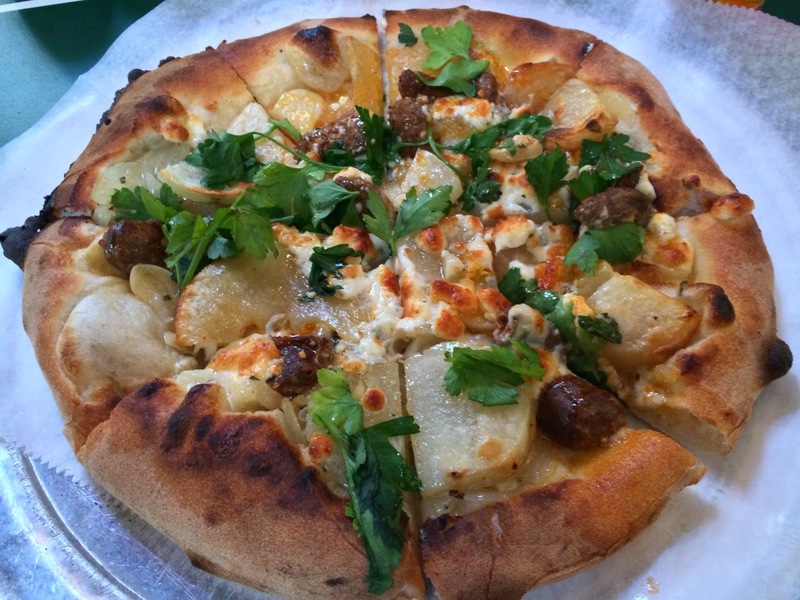 I'm also partial to the Time-Out which blends an unusual combination of toppings: sausage, potato, caramelized onion, garlic, gorgonzola cheese and parsley. Since we love meat on our pizza, we're also partial to The Stanley, which features fennel sausage and roasted bell peppers. For those that don't love pizza with meat, or animal products at all, Comet has vegan soy mozzarella available. In addition to pizza, Comet offers a slate of salads and starters, plus a line of ice-cream-focused desserts. A rotating selection of beers-on-tap most recently included Firestone Union Jack IPA (our choice, since we love IPA), the locally made Atlas District Common Lager and Allagash White. A variety of canned offerings are on hand if the taps don't meet your needs, plus wine and soft drinks. Aside from its great pizza, another couple things set Comet apart from the pack. First is its live music. Sure, Comet is swarming with families during the day and early evening, but at night it caters to a different crowd with live music and DJs (check out the schedule). The other is its interior design, a great example of industrial minimalism. The concrete flour and exposed rafters make Comet feel like a squatter in an old warehouse. The best touch though is the tables, which are painted green and striped with white tape like ping pong tables (you can see it in The Smoky's photo above). Comet has effectively managed the unusual feat of catering to three demographics: families with small kids, millennial hipsters and foodies, all of whom should find something to love here. For me, it's definitely the pizza, making Comet the neighborhood pizzeria I'm glad to call my neighborhood pizzeria. 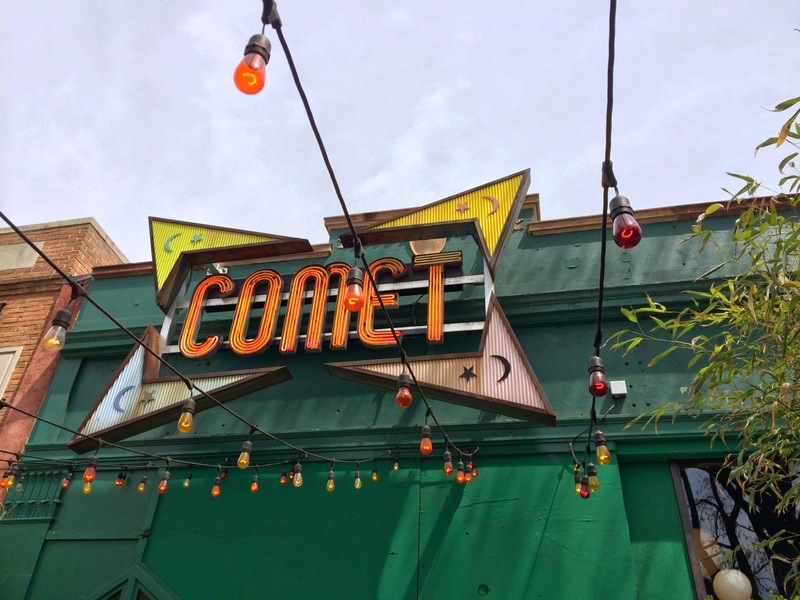 Comet Ping Pong, 5037 Connecticut Avenue NW (at Nebraska Avenue), Washington, D.C. (Chevy Chase). (202) 364-0404. Good to see this. We dined there a couple of yrs ago and the plates were dirty, which ruined the experience. Will give it another try.